On May 20, 2011, at 8 p.m. in the Kim? lecture room, after the seminar “Art of Inexperience”, a presentation of the video essay “Expired Monument, Story of a Culture Palace” (2011) took place. Authors of the work – Maija Rudovska and Shirin Sabahi. 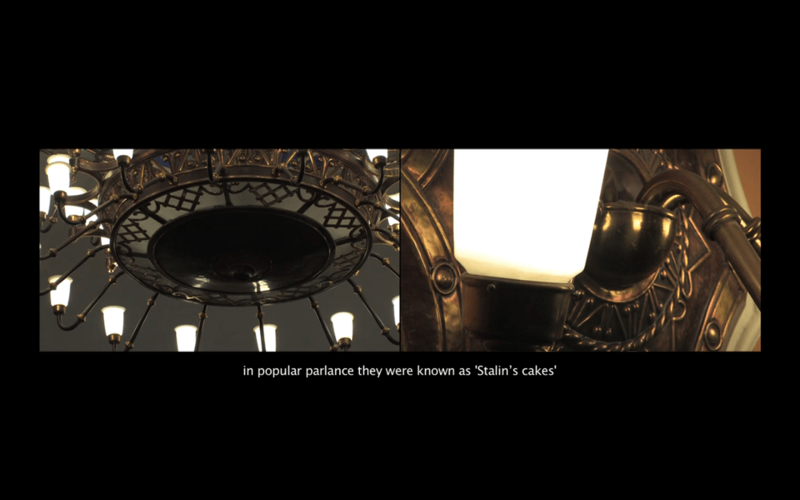 The video essay “Expired Monument, Story of a Culture Palace” serves as a poetical document of the most popular piece of Stalinist architecture in Riga – VEF building or the Palace of Culture of the National Electrotechnical factory (Valsts elektrotehniskā fabrika). The building is also one of the most spectacular examples of the local architecture of the 1950s in Latvia. The video essay reopens and updates the case of Soviet cultural heritage and its interpretations. It questions the construction of memory in the context of present cultural environment meanwhile serving as a kind of love letter to the architecture, especially the Soviet one (which is also the academic interest of one of the video authors). In the attempt to reflect on the subject matter from a different perspective, the work is generated by means of curatorial methodology. Expired Monument is an experimental project directed by the art historian and curator Maija Rudovska in close collaboration with the artist Shirin Sabahi and the operators from Tritone film studio Māris Zommers and Mārcis Ābele. The project was carried out as part of the postgraduate curatorial studies program CuratorLab at Konstfack University College of Arts, Crafts and Design, Stockholm in 2010. The film is in Latvian with English subtitles. Screen time – 10 min. Before the screening – introduction by Maija Rudovska (in Latvian).